For those of you who love a challenge and adventure in the wild, it seems you need to visit a place of natural attractions in the northern city of Bogor, West Java. In this place you will definitely megalami another sensation of tourist trips you've ever done so far. Reungit Sand Village right at the foot of Mount Salak with a height of about 800-900 meters above sea level. To reach this place is not too difficult, because many of the city of Bogor city transportation you can use to get to the sights of this cool temperate enough. Many of you can enjoy in this tourist sites, among which are several waterfalls, such as Cigamea waterfall, waterfall Thousand and ecotourism Crater Sand Queen besides Reungit also an ideal place for you to do camping, Out bound, even the Basic Education for organizations, because Reungit Sand has all the facilities for it, such as rivers, cliffs, forests and waterfalls. But of the many existing vehicle, Queen Crater which lies at an altitude of 1338 meters above sea level does have a uniqueness that offers the typical natural freshness of the mountains. Temperatures range between 10-24 degrees Celsius, always make the cold air becomes an integral part of its natural atmosphere. Moreover, this place often touched by rain in the evening. Crater Queen does have a main attraction for any visitors. The main attraction, among other geologic activity. All day kepundannya always boil and remove acid gases sulfide (H2S) with strong odors. Sometimes these noises rumbling crater due to a blast of hot water vapor to form fog. But not only that the attraction region of the crater which partially enter Cidahu, Sukabumi this. Cikuluwung watershed that crosses one kilometer crater that was offered another view. The water is so clear to make the river bed apparent. Greenish yellow color due to deposition of sulfur to make such a beautiful river bottom Cikuluwung enjoyed. However, the beauty of the river bed is not the only decoy hearts of the visitors to spend their time in order to enjoy it. Another charmer is the water temperature was tepid. So the river is the main choice for visitors to soak. Moreover, the river water containing sulphide acid is believed to cure various skin diseases. Although the Queen is still active crater, but did not disrupt the life of the plant vegetation in the region. Some plant species may in fact still alive, among them the plant Romogiling (Sceferra actinophylla). Shaped leaves are somewhat rounded tip. Vegetation is the dominant crop adorn the crater. While several other woody trees looked dead due charred by the activity of the crater. And as part of the natural forests of Mount Salak, Queen Crater was classified as a heterogeneous forest. So that natural air of coolness is very pronounced. To go from Bogor Regency, you can take it from Simpang Cibatok. Next ride public transportation are available to take up to Sand Reungit or Mount Bunder. Meanwhile, if you want to Cidahu by public transport, stopping at Simpang Cidahu, from there to ride public transportation to the terminal and continue on to the camp Cangkuang with motorcycle taxi services. On the first point, through Sand Reungit, distance and latency is not as heavy as the Mount Bunder or Cidahu. The distance between Queen Sand Crater Reungit about four kilometers can be reached by walking for two hours. Meanwhile, through the Gunung Bunder and Cidahu, the distance that must be taken as far as six kilometers and takes about three hours on foot. If you like the adventure of nature, both these lines is probably the best. Because, while up and down the valley, you can enjoy the natural beauty of the mountains in the region. Some tracks will even force you to climb the roots that dangle on the trail which is only three feet wide. However, with the weight of a track taken, it turns out this place is giving the beauty of Mount Salak forest atmosphere that is so beautiful. Here you will find a lot of river flows that sometimes the water flooded the track taken. Chirping of birds, insects and sound denyit monkey forest, still often heard, when choosing this path. Meanwhile, the path of Mount Bunder in principle similar to the path through the sand Reungit. For the third mile from Mount Bunder, this path will meet at the intersection point Reungit Sand. Beware of Pacet (leech). Because, like any area other natural attractions of Mount Salak, Queen Crater region has also become a comfortable place for life leech species that are often attached to a part of your body. If it is not always a routine check of the body, it is impossible not you going to be a target Pacet Pacet-attached and sucking blood. For that, a good idea to bring tobacco to cope with this Pacet attack. 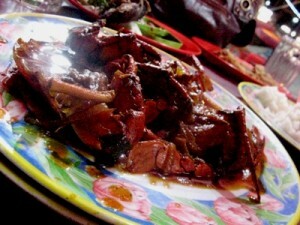 Medan is already renowned as one of the city "food paradise". 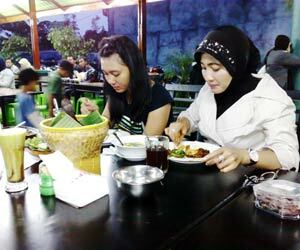 Variants of food on offer is very diverse and affordable price also compared other cities in Indonesia. Want to what almost all the food available here, from the fields of spicy cuisine, noodles aceh, coto Makassar, empek-empek palembang, Indian curry, satay madura, noodles Java, kwe tiau, liang tea, poor meatball, seafood, coastal cuisine, Oriental food to Western food is also available. A number of culinary center also exposed in various sections of the city suburbs to the city core. Call it the Freedom Walk, Pagaruyung, Warkop Sudirman, Peringgan Durian, Jalan Semarang Region - Strait Long, Castle Road, Regions Dr. Mansour, Asri Pines Boulevard Complex, Jalan Majapahit bika ambon ... and now the new culinary trend of concentration in the region are increasingly mushrooming Ring Road Field (especially the circular path of the intersection region Setia Budi, (Tanjung Sari - end of Road Ngumban Surbakti) - Across the Way, Way Black Crow (Sei Sikambing) up to the Dormitory Road, Helvetia. When evening came, the culinary center of Ring Road began to throb with sidewalk hawker traders like young coconut, roasted corn, and meatballs are prepared lapaknya respectively. Kala dusk under dim golden mercury flirting, it was the culinary pulse faster and faster. In some roasted corn booth kakai five already in operation, some young people without reluctantly began to enjoy the evening after work to hang out with friends or boyfriend. Young children might prefer berpasagan booths offering roasted corn is more relaxed atmosphere, private, and twilight. Taiwan roasted corn taste sweet, salty, or spicy enjoyed with a fresh young coconut water. When young people choose roasted corn and coconut as the location of hanging out, then the visitors who married chose the restaurant for dinner. There is also a vote cafe or fast food like McDonald's or KFC. Indeed, along the Ring Road there are so many options sidewalk stalls, cafes and restaurants as laternatif. Variety of food was also very varied, ranging from authentic Indonesian cuisine to a foreign country can be found along many kilometers of track outside this circumference. Similarly, starting from the original food Padang, Java, Aceh, Makassar until the typical mainland India was not difficult to obtain. So is a unique kind of processed duck meal, chicken penyet, bandrek, noodles shake, chicken paste, grilled fish, steak, pizza to curry. Ring Road will be more crowded as a Saturday night. would not be surprised if twisted café or restaurant more tempestuous. Some of the favorite locations of their customers seem crowded. Not only the servants who become busy, parking was no longer had time to sit down to rest because the flow out of the vehicle to various places of choice. Yes, the Ring Road area in the last two years has become a favorite choice tongkrongan culinary enthusiast. Moreover, its location adjacent to one of the luxurious residential in the Taman Medan Setia Budi. Not to mention, this location became the main liaison with the central city suburbs whose allocation into residential areas. Interestingly, since the beginning of its growth, in the afternoon at the Ring Road area seemed more crowded than the morning or afternoon. A phenomenon that ultimately change the Ring Road area into a new culinary area, shifting trends and tongkrongan hawker center from downtown to the suburbs. Ring Road area adjacent to the residential area is like a pile of sugar that provoke ant colony. Now a new culinary trend shifts to the region. Area Ring Road to be an alternative expansion "new foods" that increasingly emphasize field position as a city with a very famous culinary tourism. Ring Road might alone will endure as one of the culinary centers in Medan, an alternative hangout for the young, he probably would become a culinary icon of Medan. But it could have city plan will change the direction of the trend. It feels incomplete without a stopover to Kilkenny and to enjoy the water attractions at Lake OPI, Jakabaring. In the beginning, OPI Lake was created by the government of Palembang to PON activity in paddle sports. Length is about 517 meters and 200 meters wide. Now, Lake OPI prepared to screen sport and jet-ski for Asian sports events. Trek screen built in Lake OPI this will be a separate tour later on when an international sporting event is held. But today, visitors can still enjoy the beauty of Lake OPI although there is no game or sports competition that was held. OPI lake is relatively clean condition, and a selection of Palembang city teens to spend the afternoon and evening to enjoy the scenery around the lake. OPI Lake became one of alternative options besides water attractions Musi River in Palembang. Lake OPI also began ogled and crowded visited by tourists. Stalls have been built around the lake, although his condition has not ordered a hundred percent well and still looks chaotic here and there, but from day to day from a lot of clean up and prepare ourselves to welcome SEAGames. OPI Lake is an artificial lake, and construction is currently not depend on the budget but come from the investors. Conditions are more clear and organized, with a bid of more activities that can be done in Lake OPI. You can ride a boat around the lake, ride the water bikes, sail boats and rubber, banana boat, to try to ride a jet ski. If tired of playing water sports, a row of stalls that offer pempek, roasted corn and coconut ice ready to serve you. About the price you should pay, relatively cheap, because every game you can do with paying Rp. 15.000, (less than $2)- only. Want to try? Manado is the provincial capital of North Sulawesi is estimated that as many as 30 percent of the total population inhabit the coastal city of Manado, or DAS. The length of the coastline of Manado approximately 58.7 km and there are five major rivers that relate to the coast of Manado, the River Tondano, Malalayang, Sario, Bailang, Wusa or Paniki. Tourism in the city of Manado is very exotic. Lots of options for tourists to relax and had fun tour. From natural attractions such as the Bunaken marine park, the beauty of beaches, entertainment people, shopping centers, up to a culinary tour, available in this city. The tourist beach lovers atmosphere near the city as a place of recreation, the city of Manado is the place. 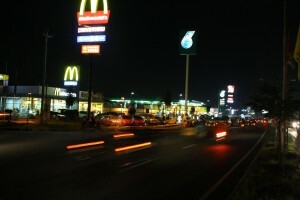 Charm of beautiful beaches can be seen from region to region Malalayang Boulevard is the center of town. Malalayang has the charm of the beach area is quite beautiful. All around there are a number of cafes built on the waterfront. All of the cafe offers a variety of seafood with grilled fish as a main dish. Therefore, people call Malalayang grilled fish. Another evening atmosphere in the Area Boulevard. Visitors can watch the panorama of nature with the island of Manado Tua in the middle of the ocean. As the sun began to slip into the western horizon, then the process of the Sunset can be seen clearly. Along with the setting sun, the area became crowded by the seller Bolevard food. They held wares in a number of tents on the outskirts of the beach. Dishes are available consist of: fried rice, meatballs, gado-gado, tinutuan, and others. The price is so cheap. The visitors can choose according to taste what he wanted. Regions Bolevard seems to have become centers of culinary evenings in the city of Manado. The atmosphere is similar Losari in Makassar. Number of visitors who come to that place. In the past two decades, tourism activity rapidly grown into one of the economic mainstay of the city. Belle tourism city of Manado in North Sulawesi province is even Bunaken National Park, which by some people referred to as one of the most beautiful marine park in the world. Its location is only about 8 km from the mainland city of Manado, and can be reached in about 2 hours cause the National Park is easily visited. In addition there is the Museum District of North Sulawesi, and Monument (Memorial), Second World War. Especially in the city of Manado, there are also several temples, one of which is Ban Hin Kiong Temple in the central city built in the early 19th century. Besides having the sights of interest, one of the benefits of tourism the city of Manado is its strategic location to attractions in the hinterland, in Minahasa, which can be reached within 1 to 3 hours from the city of Manado. Attractions include, Vulcano Area in Tomohon, Village Agriwisata Rurukan-Tomohon, mountains and Lake Panorama Tondano, Stone Pinabetengan and Waruga in Sawangan. Great tourism potential causes in the city of Manado tourism industry has been growing and developing, among others, characterized by sufficient number of hotel and other supporting facilities. Until late last year, there are additional hotel / lodging, travel agencies, restaurants and restaurants of various classes. The economic crisis and national economic recession that hit the national business community, does not affect tourism in the city of Manado. From year to year, local and foreign tourists visit even increasing. They are still filled with curiosity at Manado Tua Bunaken Marine Park is located in the upper peninsula of North Sulawesi, Indonesia. This park has a vast 75,265 hectares of land and sea which continues to grow and be protected by the government of North Sulawesi. This marine park was inaugurated by the minister of marine October 15, 1991. Bunaken has at least 40 places that are rich in fish diving - tropical fish and coral reefs and more than 150 species from 58 genera and 3,000 species of fish swim in the area "Golden Triangle" of Papua New Guinea, Philippines, and Indonesia. Biological Park is strategically located in the "triangle" is. North Park is situated next to the Sulawesi Sea that have a depth exceeding 19,800 feet. Park not far from Manado, approximately 5,000 feet (15 minutes from Manado Beach). In addition to Park, there are other attractions that are named Watu Pinawetengan. This place is located in Minahasa. The object of the tour is a stone found in the District bergores Tompaso. By local residents bergores stone is known as watu pinawetengan. This stone is a natural boulders, so the irregular shape. On the boulder there are the scratches various man-made motifs. There were scratches that make the human image, resembling male genitalia, depicting female genitalia, and stripes motif and no apparent motive means. Experts suspect that the scratches are a symbol associated with supporting community confidence megalith culture, namely belief in ancestral spirits (ancestors) are considered to have supernatural powers so as to regulate and define human life in the world. Therefore, humans must perform certain ceremonies of worship for salvation or to obtain what is expected (such as good harvests, reject or expel distress disease) by using large stones as a means to worship them. According to myth, the stone is a place where bermusyawarahnya leaders and community leaders Minahasa-Lumimuut Toar indigenous descent (ancestors of Minahasa people) in the past, in order to divide the area into six ethnic groups of tribes who belong to ethnic groups Minahasa. Until now bergores stones that have been found in Minahasa, new pinawetengan watu, contained in the working area Kawangkoan but can be regarded as an important finding and may be included as historical monuments, especially the cultural history of the Minahasa community. Wow. Amazing tours in Manado area once, yes. Yuk busy-busy there!